Breakaway Seat Box Accessory Kit The addition of the accessory kit will give you more room in your box by placing your reels on the lid out of harms way your leader line is neatly stored wher you can find it and all your leads are in the lead tray not tangled around your other tackle. Impact leads can easily be seen and the sizes reconised. 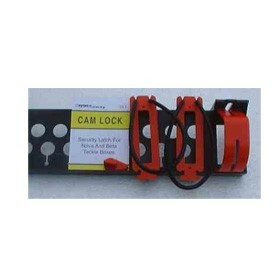 the Cam lock thats included will keep your box closed when carrying. Only fits if the backrest is used as it relies on the backrests nuts and bolts to fit. FREE Delivery on all Breakaway Seat Boxes over £100!! !